The Yankees are heading to the ALDS. Last night they beat the Athletics in a Wild Card Game that was a tad less stressful than last year’s. Up next? The Red Sox. Fun fun fun. I don’t self-promote much, but I did an inning-by-inning breakdown of the battle of the bullpens over at CBS, so check that out. Now here are some thoughts following the Wild Card Game win. 1. Man was Luis Severino electric in the first inning last night. Electric in the first inning and then a grind in innings two through four (and change). Last year the Wild Card Game got away from him. Brian Dozier hit the leadoff home run and everything kinda spiraled out of control. Things could’ve unraveled on Severino this year — after the Matt Olson walk in the second, or the Miguel Andujar error, or walk to load the bases in the fourth — but it didn’t. He had to grind it out against a very good A’s team and he got those big outs to preserve that early 2-0 lead. I’m proud of Severino. I know it’s cheesy, but he’s had a lot of ups and downs in his career already, and last year’s Wild Card Game was most definitely a down. While needing 87 pitches to fight through four innings is nothing to write home about, that game last night is what separates great pitchers from good pitchers. The Athletics would’ve knocked a lesser pitcher all around the ballpark if he didn’t have his good command, which Severino did not. Real happy with Severino. That was a character-building start. 2. I get the sense what we saw last night will be The Formula™ going forward. By that, I mean the Yankees will look to get their starter through four innings, maybe five, before beginning to think about the bullpen in earnest. Don’t get me wrong, the Yankees will happily take eight dominant innings each night. Going forward though, I think Aaron Boone & Co. are going to go into each game hoping to get four innings from their starter. If they get more than that, great. If they get less, well, they’ll have to figure it out. Four innings seems like the magic number. The Yankees were able to navigate those final five innings with their bullpen last night and they didn’t even have to use Chad Green (or Jonathan Holder). Green started getting loose in the eighth inning after Khris Davis socked the home run but he did not pitch. Getting five quality innings from your bullpen without even having to use a guy like Green is pretty excellent. 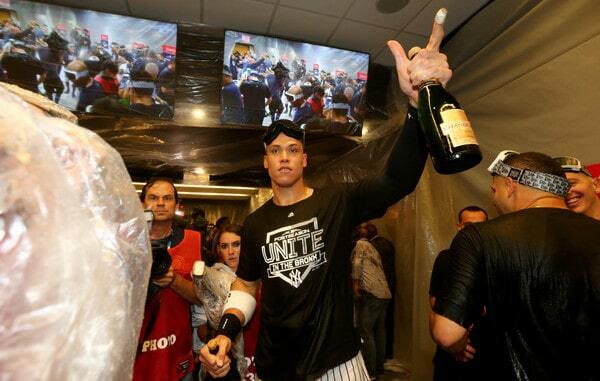 The Yankees did it last night and they may try to do it again going forward. Four innings seems like the magic number. If the Yankees get four innings from their starter, they’re in excellent shape. 3. Now, that said, I really do hope Boone has a quicker hook going forward. I hate going batter-to-batter so much. Joe Girardi did it all the time and it drove me nuts. And yes, I know that sometimes going batter-to-batter works. It happens a lot. But I still don’t like it. Especially in the postseason. Last night Boone sent Severino back out for the fifth inning after it looked like he put everything he had into striking out Marcus Semien to strand the bases loaded in the fourth inning — whatever was left in the tank sure looked it got used up during that scream and fist pump, eh? — and it nearly cost him. Severino went out for the fifth inning and before you knew it, the A’s had back-to-back singles and the tying run was on base with no outs. Do not like. Boone had a slow hook at times during the regular season and it cost him a few times. It didn’t cost him last night, fortunately. I hope we see a quicker hook going forward. Don’t try to squeeze outs when the starter’s pitch count is elevated, especially after he had to battle like Severino last night. Just go to the bullpen and let one of your very good relievers start the inning fresh. Just because they can work out of jams doesn’t mean they should have to do it every game. 4. The middle of the order was awesome last night. 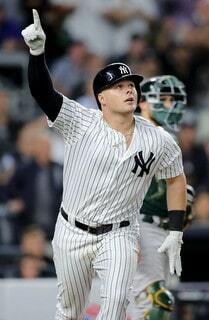 Aaron Judge and Giancarlo Stanton both went deep, Aaron Hicks had the run-scoring double, and American Hero Luke Voit had that insane triple. The 2-3-4-5 hitters went a combined 5-for-14 (.357) with two doubles, a triple, two homers, two walks, six runs scored, and six runs driven in. To win the World Series, you need to get unexpected contributed from someone. The last guy in the bullpen has to come up huge in extra innings or the No. 9 hitter has to have a big game at the plate. Something like that. But your best players have to be your best players, and last night they were for the Yankees. Judge’s power is returning following the wrist injury, and gosh, I don’t know what more there is to say about Voit at this point. He looks more and more legit each and every game. That eight-pitch at-bat against Blake Treinen was something else. Voit fouled away three of those upper-90s hellsinkers with two strikes, then got a pitch out over the plate and drove it the other way. It was a great at-bat against a great pitcher. The Yankees beat the A’s last night because their best players were their best players. That means Judge, Stanton, Severino, Dellin Betances, and yes, Voit as well. The Yankees will need those dudes to continue having games like that, and they’ll need other guys to step up and provide sneak attack contributions as well. You can’t win the World Series without ’em. 5. The corner infield defense is so bad. My goodness. Andujar is a major liability at third base and Voit’s not exactly Keith Hernandez at first base either. He threw away a potential 3-6-3 double play ball last night — Voit was on the field working on that specific play before the game too — and also failed to scoop a scoop-able ball on Andujar’s error as well. The corner infield defense is a major weakness and something the Yankees will have to look to address in the offseason. At this point though, they can only roll with what they have, and Andujar and Voit are too valuable at the plate to take them out of the lineup because of their glove. Boone was aggressive last night and put Adeiny Hechavarria at third base in the sixth (!) inning. He’s never done that. Andujar’s been coming out for defense in the ninth inning for weeks now. But the sixth? Never. That might be the new normal. Get Andujar his three at-bats and pull him for defense. It’s a Catch-22 though. If the game is close, you want Andujar to get that extra at-bat. But, if the game is close, you don’t want to risk having him out there defensively. Not great. Hopefully Andujar mashes enough to make the bad defense easier to swallow, which is exactly what he did all regular season.